Mr. Kwok Chan of the FCC presented its updated view on sensor-array technologies for SAR testing at the April 2016 TCB Workshop, and noted that progress has been made, and that the FCC is committed to working with systems manufacturers to incorporate such systems in the KDB system. Specifically, Mr. Chan said "Our plan is to treat these sensor-array systems as a different category of systems. At the moment, we do believe and we do think they have the potential to do a good job like the traditional systems. The potential is there, the systems are designed as absolute systems, and we've tried different things [sic] and we are working with the manufacturers to the extent that things are slowly moving forward, and we do want to treat these essentialist [sic] systems. These are physical systems where the system itself actually promotes very fast SAR testing, 3 to 5 seconds v.s. 40 minutes." 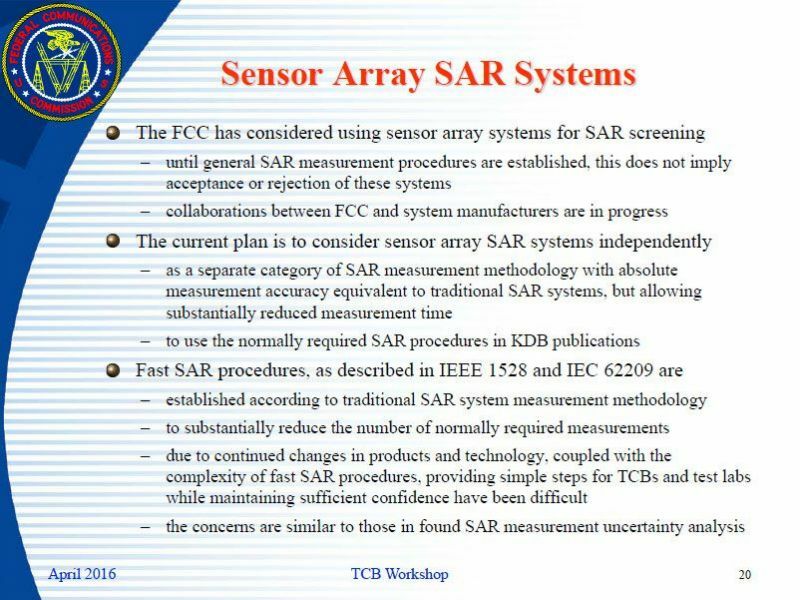 Mr. Chan’s slide mentions that “The current plan is to consider sensor array SAR systems independently.” Furthermore, drawing from Mr. Chan’s comments, particularly “we do think they have the potential to do a good job like the traditional systems,” we interpret this and other signals to mean that the FCC sees IEC 62209-3 technologies as “absolute,” “physical,” and potentially capable of replacing legacy robot systems entirely. The FCC is also not going to treat “sensor array systems” the same way as traditional fast SAR approaches. Calling the traditional approaches “virtual fast SAR,” Mr. Chan opposes traditional fast SAR approaches which are based on legacy robot systems and use approximations to extrapolate the field while measuring less points, and he prefers sensor array technologies which are based on exact physics but use a different hardware. With The FCC signaling interest in making changes (provided they acquire the data and proof that they are looking for), stakeholders in the SAR measurement business are increasingly uncertain about systems procurement and the potential impacts probe-array systems will have on turnaround times, business processes, and more. Labs looking to acquire new measurement equipment may sense new risks investing in legacy robot systems. Likewise, labs may see more than just possibilities with probe-array technologies. Manufacturers are likely hoping for a positive outcome for probe-array technologies as well.